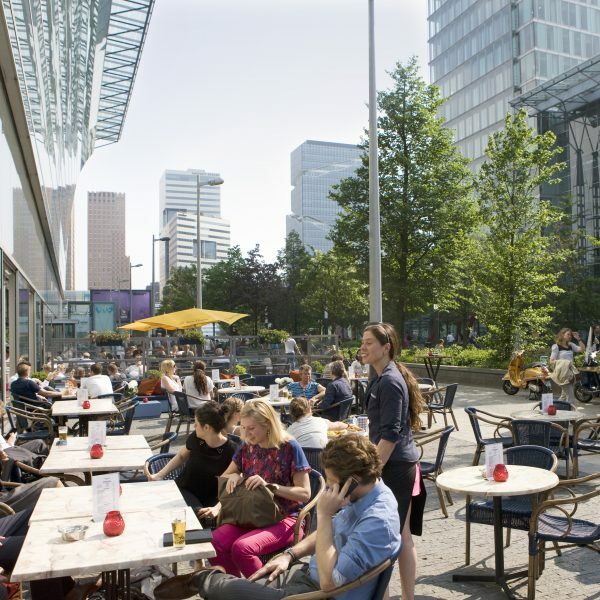 Placemaking injects new areas with new energy. During this process, city makers build new networks, and they’re responsible for introducing new activities and ensuring that real estate and public places are used more effectively. The city maker optimises the use of the city. New activities, programmes and networks create value, not only in social and cultural terms but also from an economic and financial perspective. Placemaking therefore has a proven added value to area development. It leads to better use, more activities, more participation, less vacancy, better rent prices for the owners in the area and a higher rate of return for the overall area. 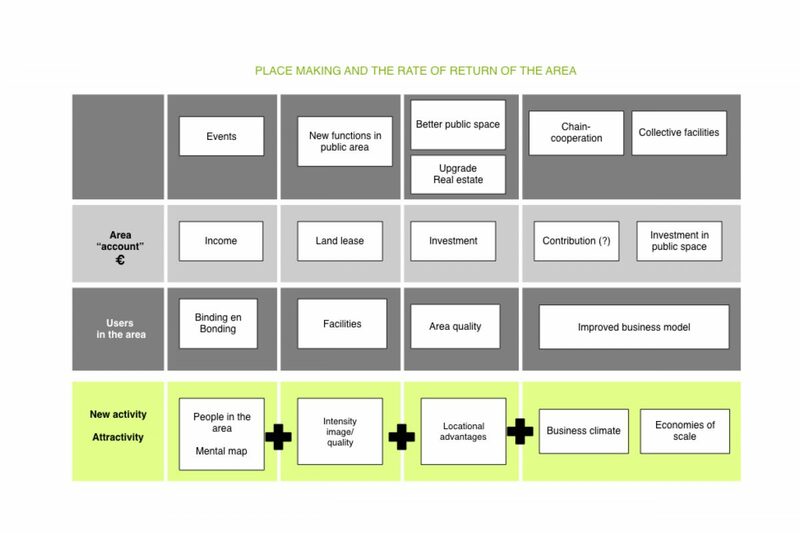 But it’s important to develop a business case for placemaking to emphasise this added value and position placemaking solidly in area development. Increasingly, area development is starting to signify the optimisation of our space. It concerns the better use of existing buildings and land, and adapting them by means of refurbishment, renovation and demolition/new-build. These processes have shifted from drafting plans and stacking stones to coordinating demand, bringing together activities and generating new networks. Apart from the hardware that’s already there (land and property), the software and orgware are becoming more and more important. Area management has undergone substantial change as a result. Because the development of land and buildings initially became part of the business case as well, there was talk of postponement. 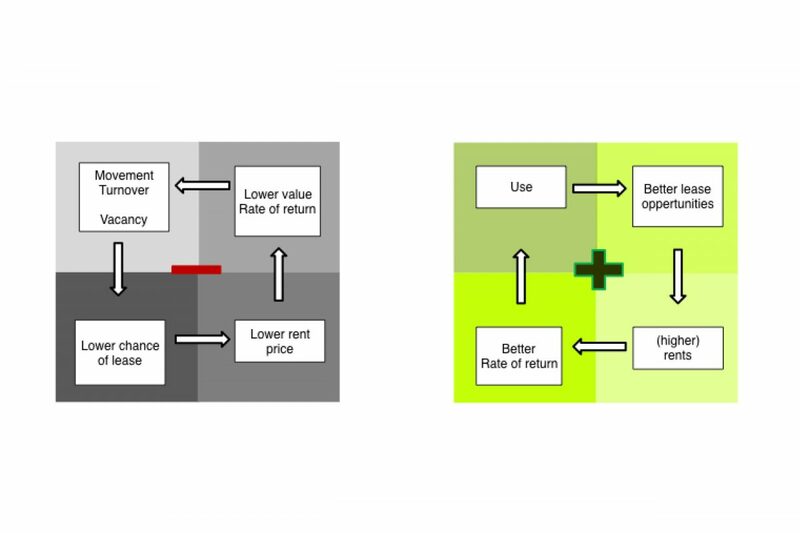 Making housing more sustainable means investing more on the front-end, but it’s precisely during development that this is recouped by means of lower energy costs. 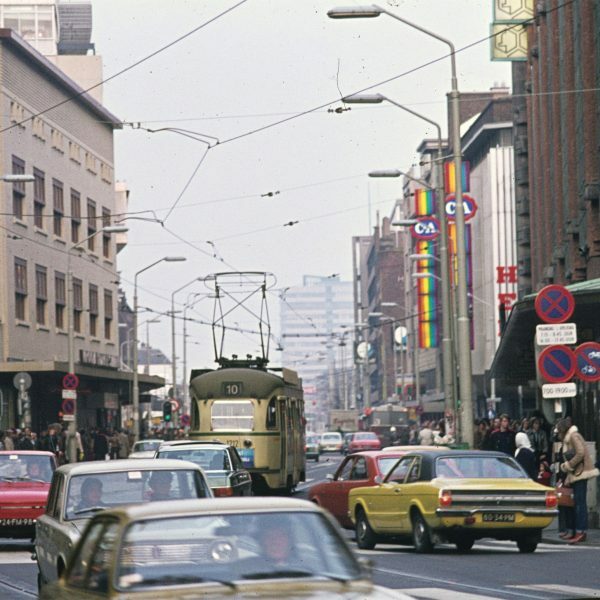 The management of the area has shifted more to the front-end because the development of existing buildings and land has become part of the area development. Initially, the development of existing areas doesn’t necessarily focus on generating major cash flows. It’s more about generating new programmes, events, activities and functions in a given area: in other words, placemaking. Functions are created with limited resources that, when successful, slowly but surely generate cash flow. Placemaking makes a social, communal and cultural contribution to the area and provides it with new meaning. Increasingly, it’s being organised based on new types of collectiveness in which parties work together and also share revenue. In many areas, these collective activities disappear once the financial development of value takes off. More traditional types of building, property development and capital are replacing placemaking and conquering the area. As a result, all of the energy that has been pumped into these areas is being lost. 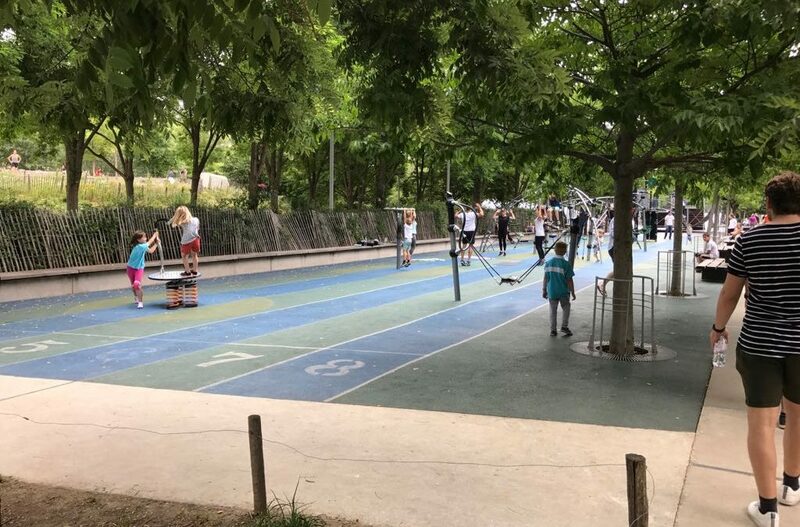 Because the revenue from placemaking often falls into other people’s hands, it remains difficult for city makers to invest, and therefore they amass little or no capital for ongoing or future projects. It’s crucial for the healthy future of placemaking that value is distributed differently. This can only happen if city makers and placemakers adequately promote their added value. Recent developments suggest things are moving in the right direction. The crisis in the land and property market has taught us important lessons. The devaluation of land and property was the consequence of a system in deadlock, but also of a loss of trust. This resulted in structural vacancy, falling returns, a deteriorating image of the areas, which set a downward spiral into motion. The striking thing about this development is that it can be turned to the positive. Giving meaning to areas increases trust among residents, companies and investors, which galvanises a process of increased investment, less vacancy and an improved image. This is reflected in the fact that the area is increasing its output. More than anything else, the increased output is creating added value for the areas’ economy, society and financial value. City makers and placemakers have proven themselves to be the engine that makes things happen. Now that the economic situation has improved and is enhancing growth and redevelopment, it’s extremely important that these processes are also accorded a permanent position in area development. In terms of sustainability and housing construction, the task is so huge that it can’t be handled only by city makers or traditional partners. This is a great opportunity for new area developers and the more traditional parties, who focus on construction, to forge partnerships. The question isn’t whether we will opt for old or new area development, it’s about which combination we decide to go for. In that sense, every task will be specifically defined and require a tailored approach. 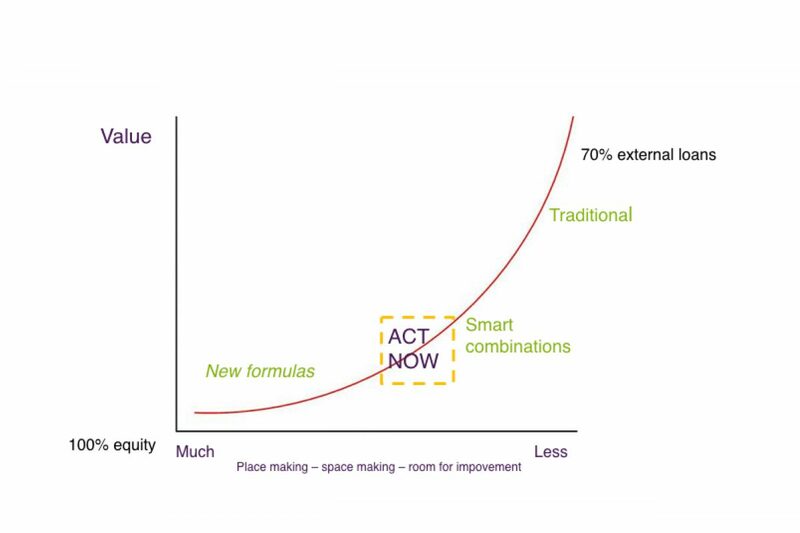 The programming has no choice but to give equal standing to placemaking and social and communal value creation, and a healthy business case for area transformation. As far as that’s concerned, the coming years will be interesting. That’s when we can convert our placemaking experiences into new assignments, together with traditional real estate and area developers. For that to succeed, it’s of crucial importance that we develop a business case for placemaking. Not only does it have to include financial and economic aspects, but also the added value for society and the community. That will make the concept of ‘value creation’ real. And consequently the added value of placemaking will become visible so that it can be adequately acknowledged. In addition to this business case, it’s essential to generate new capital. For that to happen, new funds and other forms of funding, such as crowdfunding, have to be linked up with each other. These forms of funding provide people and companies with a much greater opportunity to invest directly in projects, areas and people that are meaningful to them. This is how they can become a partner in area development.